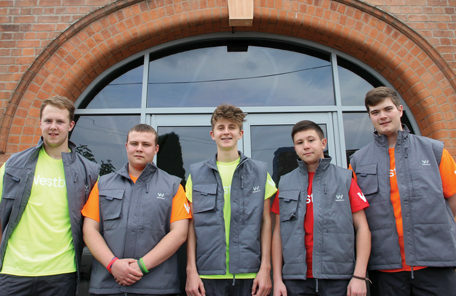 Local firm, Westbury which employs over 50 staff from its Narborough manufacturing base has relaunched its apprenticeship scheme by employing five young candidates from the Leicestershire area, as part of a recruitment campaign which ran over the summer. Westbury offers its apprentices full training, support and college qualifications with a flexible career path. See our Careers & Vacancies page for more information. Westbury apprentices (pictured from left to right: Jack Nedza, Robert Lee, Alex Mugglestone, Ryan McShane, Lewis Randall) were recently added to the Prime Minister’s Pinterest page #Madebyapprentices which is a national campaign to showcase the talent of the nation’s apprentices and the contribution they make to the economy and employers across the UK. The industrial automation leader has recently completed a first phase of works for end client Jaguar Land Rover for their new Solihull automative production facility.